Hedgesville, WV -- Calv'ry Booking and Management announces the release of "Are You Ready? ", the new single from Stoney Creek Bluegrass Band. The band has also released a music video for the single, which can be found on YouTube (see below), or at the band's website StoneyCreekBluegrass.net. The single "Are You Ready?" is available through AirPlay Direct and will be serviced to radio stations over the next several weeks. "Are You Ready?" 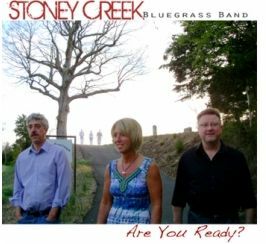 is the title track of Stoney Creek's new bluegrass gospel CD, scheduled for release on June 19. The track "Are You Ready?" was written by the late Dee Stottlemyer, sister of Stoney Creek's Libby Files. The new album also features Stottlemyer's song "Will It Be You?". The music video for "Are You Ready?" is largely a tribute to Stottlemyer, who passed away in 2004. Libby Files handles most of the lead vocals on "Are You Ready? ", but the track also contains several lines of Stottlemyer's lead vocals taken from a recording she made before her passing. The duet between Files and Stottlemyer is the first vocal guest appearance on a Stoney Creek project, and the music video shows Files visiting her sister's grave. "This particular gospel project is something that I have been wanting to do for a long time. Being able to record a song that my sister wrote is an honor, but at the same time a difficult task to do since her passing in 2004," Files says. "Throughout my thirteen years of playing bluegrass and her four or five years, we never performed or sang together before her passing. That's one thing that I regret, but it finally came down to doing it like this – adding her voice on an original song that she wrote." The music video also includes imagery from around West Virginia's Eastern Panhandle where Stoney Creek is based. One shot shows the property of the late classical banjoist and luthier Andy Boarman, who built parts and repaired instruments for Don Reno, Little Roy Lewis, J.D. Crowe, Sonny Osborne, and Stoney Creek's Darrell Sanders in the 1970s and 1980s. Boarman gave Sanders his Deering Golden Era banjo in the 1980s and helped secure Sanders' original endorsement with the Deering Banjo. The music video also shows the railroad tracks near Martinsburg, W.Va. where Sanders practiced banjo as a young teenager. The music video for "Are You Ready?" includes a mountaintop guitar break from Ed Barney, who once again delivers with his fluid brand of flatpicking. The project's mandolin player Brett Smeltzer is shown at French's Kountry Kwick Stop, the well-known home to an ongoing bluegrass jam for more than 40 years. The full band was filmed on stage at Back Creek Valley's Central Chapel. The music video and album artwork depicts a cross displaying the words "Are You Ready" filmed in Files' hometown of Jones Spring.